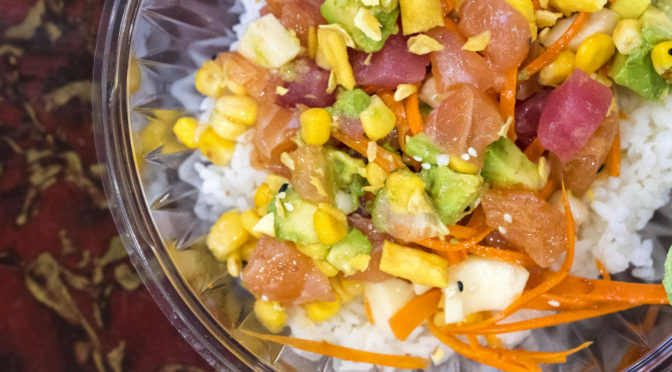 Koshe Poke is a Kosher poke joint inside Eden Wok on East 34th Street. Poke has skyrocketed in popularity here in NYC. We went from no poke restaurants to about 10 or more, seemingly overnight. 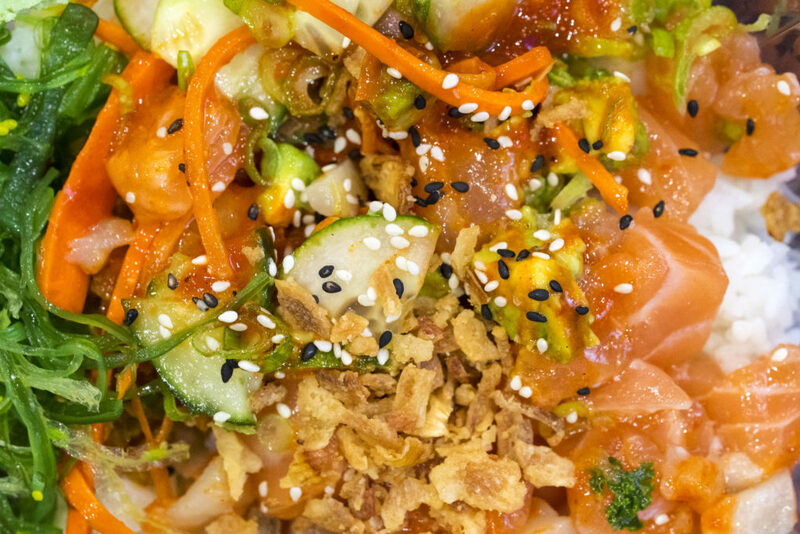 For the uninitiated, poke is essentially chopped up raw, dressed fish with flavorful toppings. It’s actually a Hawaiian dish, so many of the flavors and toppings are Asian/Japanese inspired, like sesame oil, soy sauce and green onions. In many ways it’s similar to tartare preparations of salmon and tuna, only it is generally cut into larger pieces and dressed with more items. Here in NYC, it is more like a “sushi salad,” since often times the poke is thrown into a bowl with rice, quinoa or greens. It’s even showing up in burrito form now, too. In any case, I’ve had poke a few times before the craze finally made it to NYC. Back in the mid/late 90’s, my sister lived in Hawaii for a stretch of about four years. That’s really when I first became aware of the dish, just from talking with her and having the topic of food come up on occasion. My experience with poke in Hawaii was a mediocre one. The dish I tried contained ahi that was a bit stringy in spots, so I was a little bummed out. In fairness, I probably should have tried it in more places when I was there. 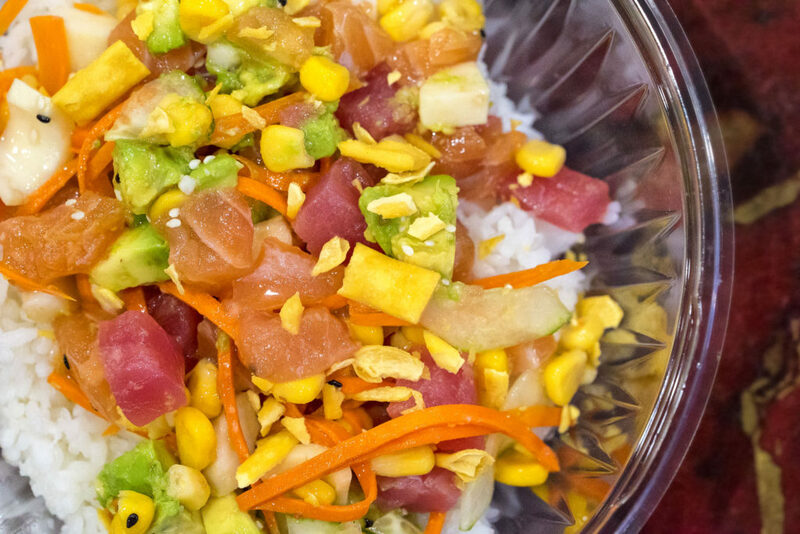 Koshe Poke is the first NYC poke joint that I’ve tried since the trend took hold. I liked it. The fish tasted fresh and was good quality, and the toppings were all flavorful and highly varied. The concept is simple, and highly customizable. You start with a choice of either brown rice, white rice, greens or a burrito as the “base” of your poke meal. 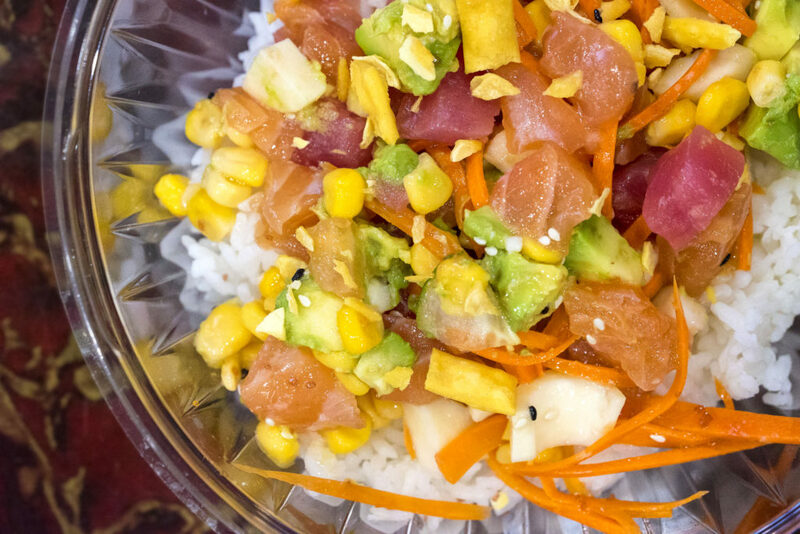 While this is not in keeping with the traditional ways of Hawaii, it makes the poke more like a full meal rather than a side or salad item. Then you choose your protein from among items like tuna, salmon, and yellow tail. You can get them grilled too if you want, and you can add additional proteins for just $2. After, you can choose up to six add-ins from a selection of 13, one sauce, four toppings, and a choice of two crispy items from a selection of 12. You get all of this for just $12, which is a great deal. I went with tuna and salmon on white rice, with carrot, cucumber, avocado, sweet corn, scallion and hearts of palm. I chose the Hawaiian salt sauce, topped it with wasabi, and added sesame seeds and dry noodles as my crispy elements. One suggestion I have is that they should have the option to get the rice served cold, that way the cold items like raw fish stay chilled and don’t warm up in the bowl from the warm rice. The main issue with that, though, is that cold rice tends to clump together and get sticky, which could be problematic. 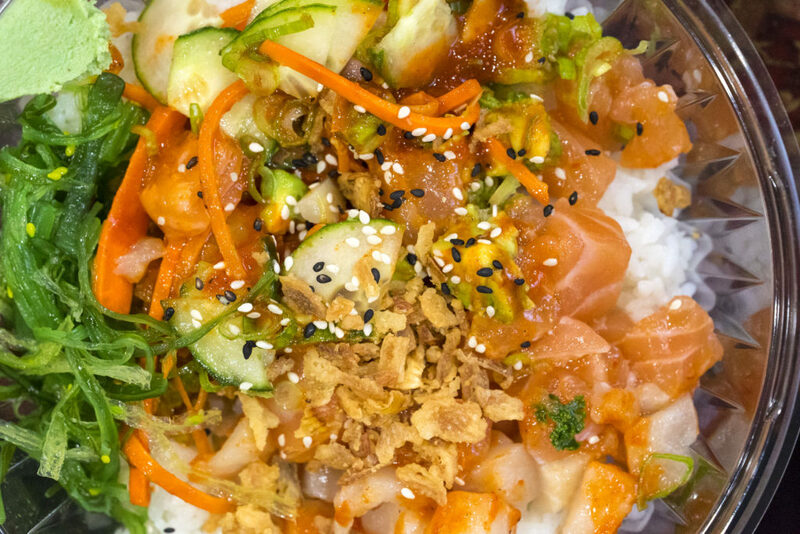 In any case, this is a good riff on poke, and I’m glad to see the item establishing a solid presence in NYC.